Who do you run to when you need help? Briana was beyond happy the day her father was released from prison. He had parented the best he could while serving time--encouraging her to do well in school, to stay away from boys and promising her that he would soon be there for her in person. When he was finally released, he kept his promise. Briana enjoyed a magical summer connecting with her father and making up for the time they had lost. Two months later, he was shot and killed. How does a child process that kind of grief? 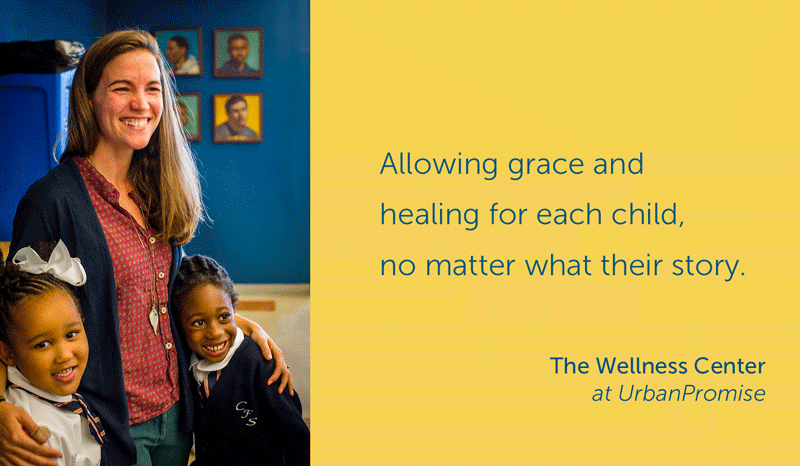 Children at UrbanPromise don’t have to face grief, depression or anxiety alone. Six years ago we started the Wellness Center to help children cope with the trauma of living in a community known for poverty, violence and scarcity. Trauma creates dark spaces that are scary and uncomfortable for children. Today, this robust program is meeting the needs of children who have faced the loss of a loved one, homelessness, abuse or the damage caused by addiction. We provide them with the means to make sense of a complicated and sometimes scary world so they can focus on their academics and after-school activities - or just remember how to be a kid. Wellness at UrbanPromise includes “quiet rooms” in our schools where kids can retreat during an intense moment of anxiety and practice breathing exercises or write in a journal. Student in grades 6-12 create personal safety plans that help them prevent meltdowns or, in the midst of one, find paths back to calm behavior. Younger children are introduced to a “frustration thermometer” to help manage emotions and stay calm in stressful moments. Libby Whitman, our full-time therapist, is always on hand to work with all of our children one-on-one. It was Libby who held and comforted Briana after her father died. When Briana expressed a fear that she would forget her dad, Libby helped her create a “memory bracelet” where each bead represented a moment from the summer they spent together. A black bead to represent the black shirts he wore; a yellow bead to represent his birthday month; a brown bead to represent a breakfast they shared when he let her try a sip of his coffee. “Grief is a messy and long process. In counseling we take small steps together,” explains Libby. Briana is showing signs of strength- she is a trustworthy friend to whom her friends flock for empathetic listening and support. Just as her dad encouraged her, she is inspiring her peers and often asks to pray for her friends in counseling. Siomara and Libby are training our entire staff to be trauma informed and together we are creating a campus that is physically and emotionally safe. Help us continue to bring healing to our youth. P.S. In 2017-18, the Wellness counseling team offered 1,027 counseling sessions to over 95 students in our schools and met 100% of referrals for counseling by parents, students, and staff. Help us continue to do this important work this year!